After posting a picture of Grand Central Station in New York, appropriately enough I headed off now to another impressive ‘space’, the Turbine Hall at the Tate Modern to see Kraftwerk perform Radioactivity in full. 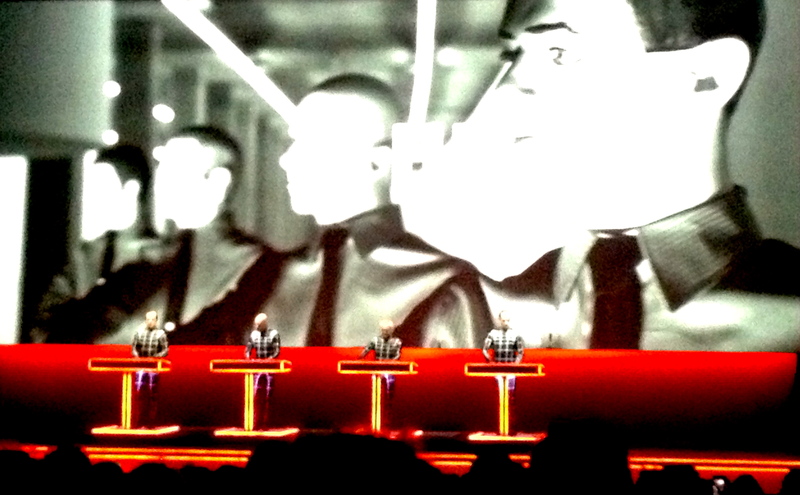 Kraftwerk were the first band I ever saw live, in 1981 at the Hammersmith Odeon, so 32 years later I was extremely excited and they did not disappoint. A wonderful evening with all of Radioativity and 80 minutes of ‘hits’ in chronological order. Well worth – in the end – the seven hours on the phone spent trying to get the tickets when they went on sale. The 3D visuals were spectacular and at one point it even looked like Ralf Hutter was tempted to move his hips. The sloped floor worked perfectly in terns of giving everyone a view – it was in the entrance to the main turbine hall as opposed to at the (flat) back section of the hall. A memorable evening and I will treasure the ‘fusion’ of my two great loves, music and art. Firstly the German language version of Neon Lights. Some of their tracks ironically sound better in English, but not this one. A quite beautiful song that gives the lie to all those ’emotionless’ stereotypes. They did play it on another night apparently..
Europe Endless was a long shot as an album track I guess, apart from on the evening that particular album was played (Friday), but I think this is one of their most influential songs – check out New Order’s Your Silent Face , or OMD’s The Right Side for two more obvious examples. And finally another long shot, The Telephone Call from the under-rated Technopop. Certainly I heard a lot of that ‘engaged’ sound whilst trying to get tickets last December..